This upstart company from California is taking the pedal world by storm with their wonderfully designed and constructed pedals. This is their attempt at cloning the legendary Klon Centaur, a famous drive pedal built by Bill Finnegan. 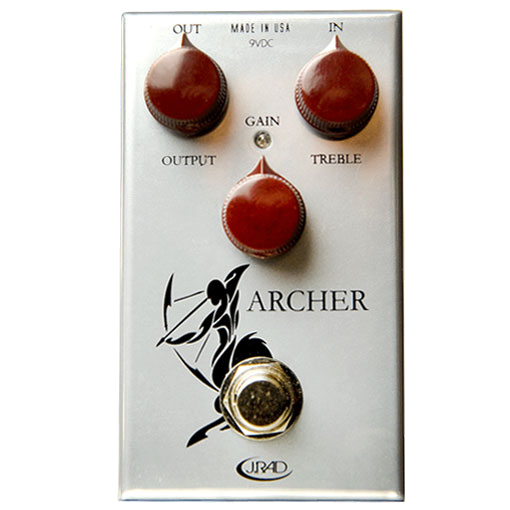 While this pedal is setting many guitar player’s hearts on fire, this may have less than the desired effect on your horn. That being said, if you can get the gain and volume under control, this thing sings! Wonderfully simple and undeniably attractive. This pedal is built like a tank and is easily laid out. Although this pedal sounds fantastic, it can have some feedback issues. It will be harder to achieve more extreme distortion without some serious fiddling with the gain and the treble knob. This pedal sounds spectacular. It has a warm sparkle to it that immediately makes you want to incorporate it more into your playing. Were it not for the issues with feedback, this would be an ideal drive pedal. It adds a crisp sweetness to your sound and is a great box for adding some warm organic punch to your sound. Product info from the J. Rockett website.